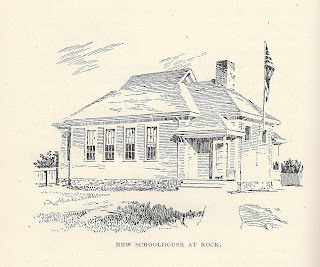 For a number of years prior to 1897, the Middleborough School Committee had felt the need for a replacement for the school at Rock Village which had been constructed in 1856. Though the 1856 schoolhouse had been described as a "fine" one the year following its construction, forty years later it was found wanting. "The demand for a new schoolhouse at Rock is imperative, the one now occupied being, in our judgement, not worth the expense required to put in a comfortable condition. Should it be thought best to repair it, even then it would be inadequate to the wants of the school, being too small for the comfort of those now in daily attendance. "We would recommend a building with two rooms, large enough to accommodate all the children in that vicinity, for we are convinced that in every instance when a union of schools has been effected the results have been more satisfactory than under the former arrangement. "We feel assured that all interested in the educational welfare of our young people will join us in our efforts for their improvement - morally, intellectually and physically." ["Report of School Committee", Annual Report of the Town Officers of Middleborough, Mass., for the Year 1895]. 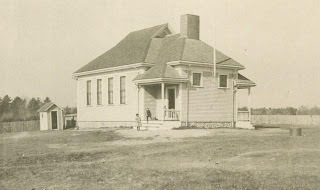 Finally, in 1897, the School Committee was authorized to construct a new schoolhouse. Plans for the building were drafted by Warren Homer Southworth, and the building constructed by B. F. Phinney. Southworth (1835-1916), a former member of the Middleborough School Committee, was also a Middleborough builder, "at one time [being] one of the busiest of the craft in the vicinity.” A partial listing of Southworth’s Middleborough buildings include 43 houses, 13 barns, the Peirce Block, Middleborough Almshouse and four schoolhouses: Union Street (1875), South Middleborough (1882), Wappanucket (1885) and Rock (1897). "The need of a new schoolhouse at Rock has been very apparent for some years. A new building was commenced and completed during the year, being ready for occupancy at the beginning of the fall term of school. "It is a wooden structure, one story high, and contains a schoolroom 26 by 32 feet, a teacher's room, 8 by 8 feet, a fuel room, 8 by 9 feet, and two separate entrances, one being for the boys and the other for girls. The ceiling is 12 feet high. "It is heated and ventilated by means of a "Banner" furnace placed in one comer of the schoolroom. Fresh air is admitted into the furnace by a duct from the outside. This air coming in contact with the hot furnace is heated, and rises, passing out into the room, while the vitiated air passes out of the room into and up a heated duct, or chimney. A complete circulation can thus be effected and the air kept pure. "The light is admitted into the schoolroom from the right and left sides through six large windows, the supply being ample even on cloudy days. The quantity of light is regulated by shades, two at each window, one rolling from the bottom and one from the top. The color of the walls is a light gray, and the ceiling is white. "The schoolroom is furnished with thirty-six 'Eclipse' adjustable seats and desks. Good black-board surface is provided. "The building is a model country schoolhouse, and every resident of the town may well feel proud of it. All things considered, the heating, ventilation, and lighting of the schoolroom is superior to that of any other room in town. Much credit is due to Mr. Warren H. Southworth of the School Committee, who drew the plans and supervised its construction. "The cut found on the opposite page [above illustration] will give an idea of the external appearance of the building. The photograph from which this cut was made was kindly furnished by Mr. B. F. Phinney, of the firm of Frank Phinney & Son, who had the building contract." "Of the $3,000 appropriated, $2,076.34 were spent, thus leaving a balance of $923.66. By a vote of the town this balance is covered into the treasury. The expenditures in detail were as follows: Lot, $150; fencing, $68.56; foundation and grading, $96.56; building contract, $1,348; furnishing, $182.59; furnace, etc., $67.73; extra painting, $15.28; plans, surveying and incidentals, $65; printing, $3.75; well, pump, platform, etc., $78.87." Besides the furnishings mentioned in 1897, the interior of the school was furnished with various other pieces over the course of its history, including a painting from James Whitcomb Riley, a bust of Sir Walter Scott, and an organ for which the students had raised the funds. During the early years of the Rock School's existence, enrollment was maintained at close to the maximum level of pupils. Later, crowding became a problem, partially as a consequence of efforts to relocate pupils from the South Middleborough School which also suffered from lack of space. 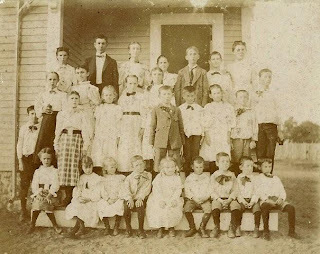 In 1919, grades 7 through 9 were transferred to the School Street School. Still, the number of pupils remained high. In 1921 it was reported that "the congestion at the Rock school this year - the membership now numbering 53 - has been relieved by having grade one attend afternoon session only and grade two the morning session only." In September, 1923, the school opened with its largest enrollment to date: 58 pupils. By the mid-20th century, the fifth and sixth graders had been shifted to Middleborough center and the lower grades remained split between Rock and South Middleborough. The Rock School was added to in 1951 which provided additional space as did the relocation of the area's fourth graders following the opening of the Burkland School addition in 1974. Following this reshuffling, South Middleborough housed the second and third grades while Rock concentrated on the first grade and later kindergarten. This division remained in place until 1990 when the Rock School was finally closed, primarily as a financial measure but one which finalized the centralization of Middleborough's schools, a process begun well over a century earlier. Top: Rock School, 63 Miller Street, Middleborough, photograph, c. 1900. 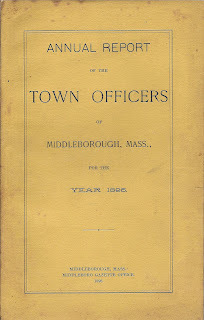 Top Middle: Annual Report of the Town Officers of Middleborough, Mass., for the Year 1895 (Middleborough, MA: Town of Middleborough, 1895). The report was printed by the Middleboro Gazette. Center: Rock School construction contract, June 17, 1897. Bottom Middle: Rock School, 63 Miller Street, Middleborough, engraving, 1897. The flag in the engraving was donated the year the school opened by prominent Rock manufacturer Charles Atwood. Bottom: Rock School pupils, photograph, 1897. Front row, left to right: Arlena Tinkham, Florence Pierce, Bertha Pierce, Carlton Dunham, Susie Tinkham, Walter Lakey, James Chace, Neal Kerr, Leslie Thomas. Middle row, left to right: Joe Westgate, Susie Merrihew, Lena Chace, Lottie Thomas, Winnie Lakey, Mabel Lakey, Hattie Westgate, Roland Tinkham, Clarence Shaw, Elsie MacKeen, Arthur Westgate, Clifford Dunham. Back row, left to right: Jennie Westgate, Francis Carver, Mary Harvey, Hattie Southworth, Oscar Westgate, ? Sherman, Helen S. Maxim teacher.